1.1 The existing Castle Peak Fish Market (CPFM) operates in a deteriorating, sub-standard, single storey temporary structure built 29 years ago, without suitable measures to control noise and odour. The building area is inadequate to effectively manage activities necessary for the efficient operation of a modern fish market and together with a lack of suitable parking and loading areas impacts an environmental nuisance to nearby residents in the Sam Shing Estate and Hanford Gardens. Due to a lack of space and the need to maintain the operations the present building cannot be improved and relocation to a purpose designed building is necessary. 1.2 A Joint User Complex and Wholesales Fish Market (WFM Complex) at Area 44 in Tuen Mun is proposed to be built by the Architectural Services Department of the Hong Kong SAR. The location of the proposed WFM Complex and its surrounding environment are illustrated in Figures 1a & 1b. The WFM Complex is to provide a permanent site for the relocation of the existing temporary wholesale fish market at Tuen Mun Area 27 and to accommodate community facilities such as a community hall for public use. Figure 2 shows the location of the existing sub-standard temporary Castle Peak Fish Market (CPFM) and its surrounding environment. 1.3 The proposed WFM Complex is a designated project under Schedule 2 of the Environmental Impact Assessment Ordinance, Cap. 499 (EIAO). The Environmental Impact Assessment Report of the proposed WFM Complex was prepared in accordance with the Study Brief, ESB 061/2000, issued by the Director of Environmental Protection (DEP) and the Technical Memorandum on Environmental Impact Assessment Process (TMEIA). 2.1 The WFM was first included in Area 44 in the Tuen Mun New Town Master Landscape Plan in 1978 and shown on the Tuen Mun Outline Zoning Plan (OZP) No. LTM/2. The Tuen Mun OZP No. S/TM/5 gazetted October 1987 rezoned the site now occupied by Yuet Wu Villa from “Industrial” to “Residential (Group A)” at the same time retaining the whole length of the waterfront in Area 44 as a site for a combined wholesale vegetable, fresh water fish and FMO crustacean market. No objection to the OZP was received during the exhibition period. 2.2 The Environmental Improvement and District Development Committee (EIDDC) under the then Tuen Mun District Board (TMDB) discussed the proposed site at several meetings during 1996 and requested the Planning Department to review the permanent site for the market in Area 44 and consider alternative sites. A total of nine possible sites were evaluated and with the exception of the site in Area 44, all were found to be unsuitable. 2.3 The Committee for Planning and Land Development (CPLD) formally endorsed the Wholesale Fish Market (WFM) at Area 44 by circulation in April 1997, and the TMDB approved this site in April 1997 with no adverse comments received at the briefing to the Board in November 1997.
b) shift the whole complex in Area 44 northwards by 20 metres, thereby taking it (the WFM) further away from Yuet Wu Villa. 2.1In view of the deterioration of structure, inadequacy of space for operation and environmental nuisance imposed on the residents of the Sam Shing Estate by the temporary Castle Peak Wholesale Marine Fish Market (CPFM) at Area 27 of Tuen Mun, relocation of the market to a permanent area is necessary. The permanent WFM Complex is proposed to be relocated at Area 44 of Tuen Mun where the provision of community facilities is required to meet the needs of the expanding local population. 2.6 The proposed WFM Complex will have fisheries trading activities only at the ground floor level. These activities include wholesale chilled fish operations during the early hours of the morning (peak hours from 3:00am to 6:30am). The nominal design capacity for the fish market is 7900t per annum. (current throughput is approximately 6200t per annum or 17t per day). In addition to chilled fish auction operations, the WFM also caters for the unloading from vessels and the loading on vehicles of boxed fish (already boxed in ice) and live seafood during others hours (from 7:00am to 2:30pm). AFCD anticipate that boxed fish sales will gradually increase, currently 360 kilograms/day (0.35t/day), whilst the throughput of live seafood is around 660kilograms/day (0.65t/day). The market opening hours are from 3:00am to 5:00pm daily. 2.7 The WFM Complex includes a community hall, a spectator stand (for viewing the annual Dragon Boat Race) and other possible community uses which will provide much needed facilities to the nearby residents. In addition, the provision of a landscaped garden above the Fish Market will improve the visual environment along the shoreline. Table 2.1 shows the components of the proposed WFM Complex. The building layout plans are shown in Figures 3, 4, 5 & 6. 2.8 The joint-user complex originally incorporated a possible library which is included in the EIA study brief. Leisure and Cultural Services Department (LCSD) however, have reservations on the suitability of this site and currently do not support the inclusion. The provision allowed for the public library is therefore reserved for other possible community uses, which are also considered as environmental sensitive receivers and have been given full regard in the EIA study. 3.1 In order to address the environmental concerns, the EIA study has been conducted with reference to the operation of the existing temporary CPFM in addressing the likely key issues including air quality impact, noise impact, water quality impact and waste management. Hazard assessment was carried out through the identification and evaluation of different failure scenarios associated with ESSO’s Liquefied Petroleum Gas (LPG) Compound in the vicinity of the proposed development. The potential environmental impacts arising during the construction and operational phases are identified and evaluated. Mitigation measures and recommendations were proposed, where necessary, to alleviate the environmental impact and concerns. 4.1 As the subject site is an existing vacant flat area, it is expected that no extensive excavation at the site will not be required be required and only typical site construction activities will be involved. With the implementation of suitable mitigation measures, construction activities will not result in unacceptable environmental impact.with the highest potential to generate dust during site formation will be minimal. The potential air quality impact arising from the construction of the proposed WFM has been assessed and found to be within acceptable levels with the implementation of dust suppression measures. Construction works will be closely monitored to avoid smoke emissions from improperly maintained powered mechanical equipment (PME). 4.2 Notwithstanding that minimal air quality impact due to the construction activities is anticipated, the “Dust Control Requirements” as listed in the Air Pollution Control (Construction Dust) Regulation should be complied with throughout the construction period. Good site management to ensure the proper functioning of PMEs is essential and will be checked by daily site inspections. 4.3 For the operational phase air quality impact, the assessment has considered odour from the fish market and RCP operations, emissions from additional lorries using the area and emissions from fishing vessels approaching or leaving the market as potential sources of impact on air quality. These These sPotential sources of odour have been assessed using direct direct measurements (e.g. odour samples taken ken at the existing CPFM), where necessary, and air quality prediction models adopting conservative assumptions to ensure that all potential impacts are properly addressed and received necessary mitigation. 4.4 Odour from market operations during the peak hours (from 3:00am to 6:30am) has been assessed for the worst case scenario over a year. The predicted odour concentrations at most air sensitive receivers within the study area (i.e. within 500m of the site boundary) are well below the acceptable criteria and would be unlikely to cause a nuisance. 4.2levels likely to cause a nuisance.that are considered objectionable. 4.5 Daytime (i.e. non peak) operations (from 7.00am and 2.30pm), involving the unloading from vessels and direct transfer to parked lorries of live seafood and preboxed fish also have the potential to generate odour nuisance, but at a much lesser extent than during the night time auction operations. In view of the fact that Tthe throughput is considerably less than that during peak operations and the odour from live seafood and preboxed contact of fish with the open air is in fact weaker than with chilled fish, greatly reduced and in view of thisit is considered that the odour emissions will at the most be 50% of peak levels. The nearby sensitive receivers that open only during the day are particularly other users of the market complex, Lawn Bowling Green and Tennis Court in the adjacent District Open Space. However, even if emissions are conservatively estimated at 50% of peak levels they will not result in unacceptable odour levels after mitigation. · implementation of a management plan to ensure and monitor good handling and cleansing practices at the market, including suitable containment and daily removal of all organic waste and regular maintenance of equipment. · good design with easy clean detailing and use of impervious materials to avoid build up of odour from organic material carried in washing water. The above measures will ensure that there is minimal risk of unacceptable residual odour impact at any of the identified receivers as a result of market operations. 4.7 The WFM management will pay particular attention to the specified mitigation measures for odour reduction and to any complaints that arise from nearby receivers. During the initial 12 months of operations regular odour patrols will be carried out by an independent environmental consultant to monitor and verify if the operation of the WFM would confirm that odours likely to cause aany odour nuisance are not to the nearby sensitive receiversattributable to the operations of the WFM. In the event that such monitoring showthat there is a distinct incidence of unpleasant odourimpact at any receiver that is confirmed to be attributable to the operations of the WFM there is provision in the building design to incorporate a scrubber system into the ventilation system to remove odour before it is discharged outside the complex. 4.8 Deodourising systems will be incorporated in the designs of the RCP, Marine RCP and public toilet to mitigate possible impacts from these sources. 4.9 No unacceptable impacts are expected to arise from offsite marine traffic or vehicular emissions and mitigation measures are not necessary for these potential impact sources. 4.10 In summary, the construction and operation of the complex should not lead to unacceptable air quality impact at any of the identified air sensitive receivers provided that the recommended mitigation measures are adopted. 5.1 The construction of the proposed WFM complex is anticipated to last for 2634 months (including 9 months piling)9 months for foundation construction and 25 months for superstructure construction) and standard construction equipment will be used on site. The potential construction noise impact on the nearby sensitive receivers during the foundation and superstructure phases has been evaluated. The assessment demonstrates that with appropriate mitigation measures, such as the use ofusing quiet powered mechanical equipment, the construction noise levels at the nearby sensitive receivers are within the acceptable noise limit as stipulated in TMEIA. Practical noise mitigation measures such as scheduling of works, use of movable noise screens and good site management practices are recommended to further alleviate the potential construction noise impact. 5.2 TThe assessment has identified fixed noise from market operations, traffic noise from additional lorries using the area and marine traffic noise from fishing vessels approaching or leaving the market as potential sources of operational noise impact. These sources have been assessed using direct measurements (noise survey taken at the exiting fish market), where necessary, and noise prediction models adopting conservative assumptions to ensure that all potential impacts are properly addressed and received necessary mitigation. 5.3 Sources of fixed noise arising from the market operations and building services plant including that from vessels berthed at the waterfront and lorries loading or waiting to load fish will not expectedcause unacceptable noise impact on any identified sensitive receivers after the recommended mitigation measures are implemented. · implementation of a management plan to ensure and monitor good practices for lorry and vessel management and schedule regular maintenance of equipment. 5.5 Traffic noise from lorries using the market is not expected to cause unacceptable impact on nearby sensitive receivers in view of the limited additional traffic (up to 40 lorries) involved. Nevertheless, to minimize the potential off-site traffic noise nuisance that may be caused to nearby sensitive receivers, the WFM access junction will be designed to allow only entrance to or exit from the WFM complex to the northern section of Wu Shan Road. 5.6 Marine traffic noise from the engines of vessels approaching or leaving the market is not expected to cause potential nuisance to any of the sensitive receivers close to the market irrespective of the route they take. Since the operation of the WFM complex is will not increase vessel traffic within the typhoon shelter, it is unlikely that the associated marine traffic noise impact will be greater than at present. 5.1Traffic noise from lorries using the market is not expected to cause unacceptable impact on nearby sensitive receivers in view of the limited additional traffic (up to 40 lorries) involved. Nevertheless, to minimize the potential off-site traffic noise nuisance that may be caused to nearby sensitive receivers, exceed the acceptable limit at any sensitive receiver even without mitigation to deter the use of southern section of Wu Shan road. To reduce noise even further to receivers facing Wu Shan Road it is proposed to engineer the WFM access junction will be designed to allow onlydeter entrance to or exit to from the WFM complex from to the southernnorthern section of Wu Shan Road. 5.8 In summary, the construction and operation of the WFM complex will not lead to unacceptable noise impact at any of the identified noise sensitive receivers provided that the recommended mitigation measures are adopted. 5.1Marine traffic noise from the engines of vessels approaching or leaving the market is not expected to cause a potential nuisance to any of the receivers close to the market irrespective of the route they take. At Marina Gardens nNear the western entrance to the typhoon shelter vessel engine noise may be close to the prevailing background levels but in view of the existing night time noise source from steel barges at this receiver and the likelihood that fishing vessels will use either entrance to the shelter it is unlikely that vessel noise will be greater than at present. As further mitigation it is proposed that Marine Department to monitor vessel traffic approaches to the new complex and to encourage the continued use of the eastern entrance by most fishing vessels, which is likely anyway if vessels use the typhoon shelter’s eastern mooring facility. 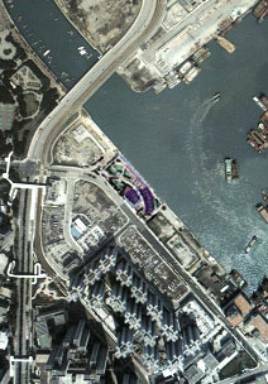 6.1 The WFM Complex is bounded to the east by the typhoon shelter at Castle Peak Bay. The ambient water quality in the vicinity of the typhoon shelter generally complies with the Water Quality Objectives (WQO) of the North Western Water Control Zone. 6.2 During the construction period, the water pollution sources will include piling works, wheel washing, surface runoff and occasional spillage of oil from equipment. The surface runoff generated will mainly be laden with silt and mud and appropriate silt traps will be constructed to avoid water quality impact on the water body. Chemicals will be handled in proper manner in accordance with the statutory requirements and guidance notes. 6.3 Wastewater and surface runoff from the construction site should be collected and treated appropriately before discharge into storm drains. The required effluent discharge standards and monitoring requirements as stipulated in Water Discharge License willshould be complied with throughout the construction period. 6.4 Major water pollution sources during the operation of the WFM Complex are cleansing of WFM and refuse collection points and sewage from toilets. The wastewater will contain suspended solids and organic matters and will be discharged into the main foul drainage system. 6.5 As the site is located in urban area, all the wastewater and foul discharge generated from the WFM Complex willshould be directed to the foul sewer, whereas uncontaminated rain water willshould be directed to the surface water system or directly into the sea, whichever is appropriate. 7.1 The general approach of waste management plan is prioritised as elimination, reduction, reuse, treatment and then disposal of waste. The handling of waste willshould be conducted in accordance with relevant ordinances, regulations and guidelines to ensure that no environmental nuisance is caused. 7.1Construction wastes including vegetation, plywood, excavated soil, rubble, packaging and garbage are likely to be generated during the construction period. Small quantities of chemical waste such as lubricant and thinner for the construction works are also anticipated. 7.2 No special waste will be generated during the construction period. The major construction wastes include excavated soil, spent concrete, wooden board and steel; and solid waste such as garbage, plywood and scrap metal. A Waste Management Plan (WMP), to be approved by the Architect, will be required in the building contract in accordance with the Works Bureau Technical Circular No. 29/2000 to set out the disposal strategy and waste management practice to be implemented by the Contractor during construction. 7.3 Market operations will generate daily waste including broken polyfoam boxes, and small amounts of other plastic debris and dead fish. Reusable containers including polyfoam boxes will be used for fish rather than one-use containers. Recycling of material from broken polyfoam boxes will be arranged through a specialist contractor. After cleansing of the market the small amount of dead fish that remains will be sealed in collection bags and removed to the RCP in sealed containers within two hours of completion of auction activities. 7.4 Municipal solid waste generated from the community hall, offices and other possible community uses will be segregated. Reuse of materials will be practiced, as for example single-sided paper for rough works, as much as possible within the subject development. Any recyclable and reusable materials will be collected and sent to waste collectors for regeneration. 7.5 A management committee will be established to oversee the management and smooth running of Tthe Complex. The committee will draw up and implement a waste management plan to identify appropriate segregation and disposal of all waste and to check and maintain tidy and hygiene conditions for Tthe Complex at all times. The committee will be responsible for regular assessment and updating of the management plan as necessary. 8.1 The location of the WFM Complex is such that about one-third of it would fall within the consultation zone of the LPG installation existing in Area 44 Tuen Mun. The risk assessment, through the use of hazard identification, identified a number of failure scenarios associated with the operation of the LPG installation. The assessment results demonstrate that there is no unacceptable risk to the population of the area. · Presence of a “crane free zone” to reduce the risk of tank damage due to crane operations during construction. · Before excavation work is undertaken, the gas company will be contacted to obtain information on all gas pipes in the vicinity of the site. Suitable pipe locating devices and hand dug trial holes will be used to locate and confirm position of underground pipes. All workers will be given sufficient guidance about working in the vicinity of pipelines. Excavation will be carried out with due care following any advice given by the Gas Authority or Gas Company. · Presence of a manually operated warning siren to instruct people to take shelter timely in case of emergency and thus reduces the risk to lives. · Arrangement will be made with ESSO to avoid LPG delivery during the hours when the spectator stand is fully occupied on the day of the Dragon Boat Festival. · The final design of the WFM complex will minimize pedestrian access to the area of podium within the 150m consultation zone by concentrating planting areas within this zone of the podium where possible. 9.1 An environmental monitoring and audit (EM&A) manual has been prepared for the construction and operational phases of the proposed WFM Complex in order to monitor the noise impact, air quality, water quality and waste management. The manual has also been submitted along with the EIA Report. 10.1 The potential environmental impacts due to the construction and operation of the proposed WFM Complex have been assessed with respect to the environmental aspects including air quality, noise, water quality, waste management and hazard to life. With the implementation of suitable mitigation measures and EM&A programme, the construction and operation of the WFM Complex will have no adverse impact on the environment.